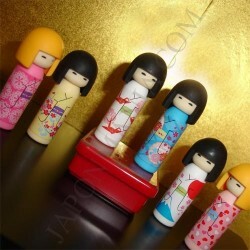 Everybody agree that Kokeshi are cute, lovely, beautiful, kawaii. So what to say about these Kokeshi erasers? Aren't they way above kawaii? So cute in fact, that some of you might hesitate to use them. As for us, we simply love them! Set of 6 erasers (1 x 6 motifs). Size: about 4 cm x 1.5 cm x 1 cm environ. Do not eat. Keep away from children mouths.